Over a 12 days span in mid-July, Bill made five stops. He could be found at the Walworth and Sodus Farmer’s Market, right between the blueberries and the tomatoes. He visited the Ontario County 4-H at Beechwood State Park and the Canandaigua Boy Scouts. 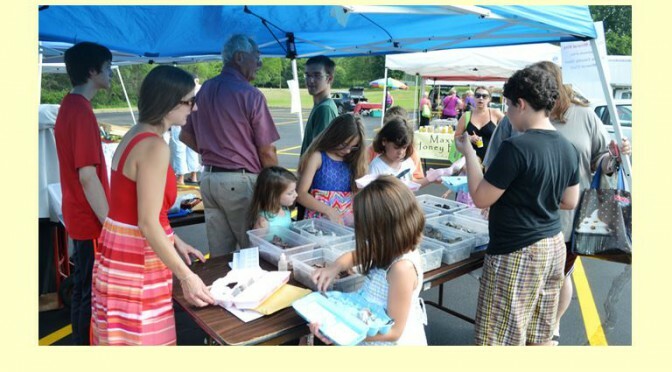 Finally, on Sunday July 24th, Bill was set up at Sonnenberg Gardens Summer Open House. 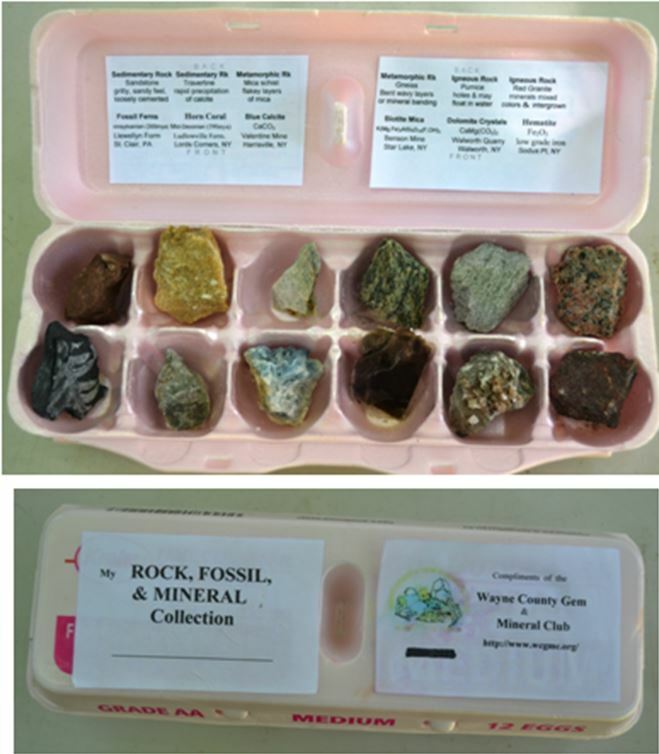 All told over 180 children went home with rock and mineral collections from the five events. In the process they were introduced to the three basic rock types, saw carbonate minerals fizz in acid, learned what a horn coral is, and how biotite peels into neat sheets. We should acknowledge that while Bill was the mastermind behind the operation, he did have help. 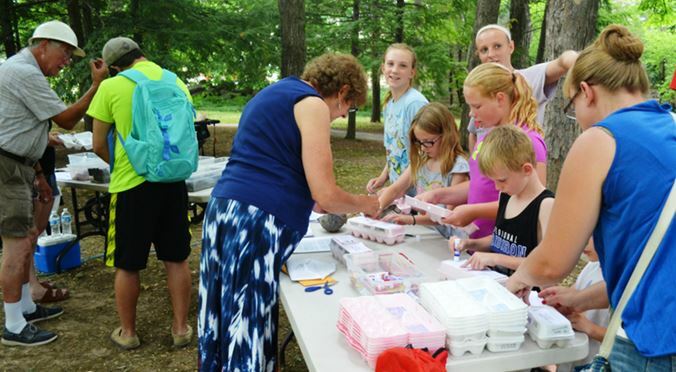 Fred Haynes, Rita and Amber Lesniak, John Murtha, Henry Becker and Cheyenne Daniels all chipped in at various sites to help with the creation and distribution of the kits. Walworth Farmer’s Market: John Murtha (green) and Henry Becker (red) assist Bill. Note the 12 bins on the left table containing the rocks and minerals each child must locate and select for their kit. Yes, Bill wore a hard hat for the Sonneberg Gardens event. 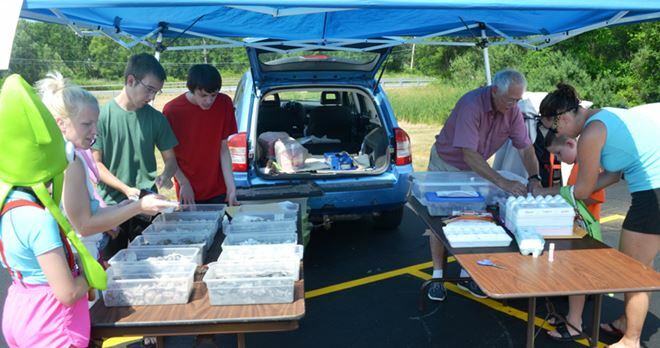 He is explaining a Devonian horn coral here while Rita Lesniak helps a group of eager youngsters prep their egg crates for their collection. 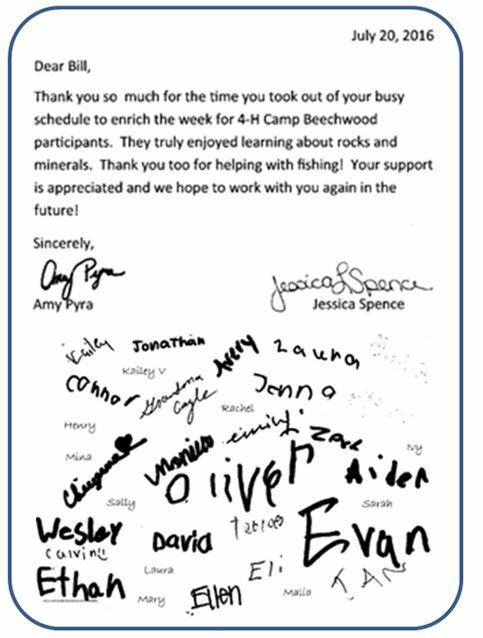 Bill impressed the 4-H group so much that they responded with the note below: .